It's easy to find tutorials to convert AVI to MP4 on macOS after your search the internet while it's tough to get a satisfying result on Mac, considering the AVI to MP4 converting speed, the output image quality, easiness, etc. If you are in a hurry to enjoy AVI videos on MP4 accepted mobile phones in high quality without yielding too much of your time for conversion, this article is the way out, sharing top 5 best AVI to MP4 converters for macOS in 2019, with pros and cons listed based on users & editors' reviews. 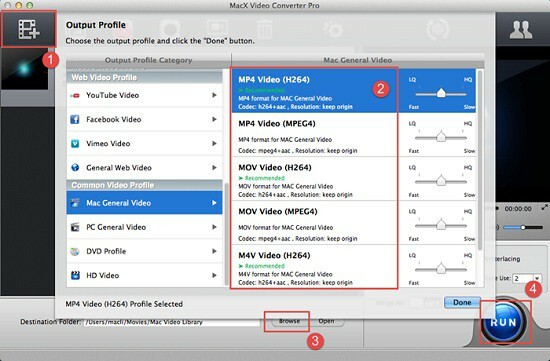 MacX Video Converter Pro features an intuitive interface, making it easy to operate for users at any level. According to 9to5Mac, it's the world's unique AVI to MP4 converter for Mac in 2019 that is armed with hardware acceleration technology, enabling QSV to speed up AVI to MP4 conversion up to 5x faster, rather than at the expense of CPU occupation. On top of that, it won't sacrifice any image quality, thanks to the high-quality engine and deinterlacing tech. If you use a PC, you can get the Windows version to convert AVI to MP4 as well. Convert AVI to MP4, WMV, MKV, MOV, MTS, virtually any format, with 370+ video/audio codecs equipped. Convert AVI to mp4 for iPhone, iPad, Samsung, HTC, PS4, Windows Phones, 420+ mobiles. Download online videos from YouTube, Vimeo, Dailymotion, Fadebook and more. Compress AVI to smaller size via trimming/cropping, adjust parameters and add subtitles to AVI. Record on-screen activities in AVI, MP4 or so and make photo slideshows with music. How to Convert AVI to MP4 on Mac Easily and Fast? Free download the top video converter on Mac computer (iMac 5K/4K or MacBook Air/Pro). There is also Windows version (Win 10 supported). Step 1: Launch this AVI to MP4 converter for Mac and click "Add File" button to load the AVI videos. You can also drag and drop AVI files into the window. Step 2: To convert AVI to MP4 on Mac, simply select MP4 from the list. As there are 200+ formats and 420+ devices profiles available, you can also convert avi to mov, avi to 3gp, avi to DVD, wmv, flv, mkv, h265, iPhone, iPad and more. Step 3: Click the "Browse" button to set an output folder to save the avi to mp4 converted video. Step 4: Tap "RUN" Button to start to convert AVI to MP4 on Mac. BTW, those four simple steps are also available to convert among different formats. [Important Note] You're strongly suggested to check the Hardware encoder box to use the Intel QSV tech to speed up the avi to mp4 conversion on Mac. The speed can top 5x faster than others. Miro Video Converter is well known for its stripped-down interface that allows even the beginners to convert AVI video for Mac's MP4-playable QuickTime with a minimal fuss. Despite the AVI to MP4 transcoder for Mac has only a few output profiles compared with other tools, the wide range of format support, like .avi, .mp4, .flv, .mkv and more, ekes out, making it really a great tool to fast convert video to MP4 from AVI files. * Relatively outdated device profiles. The wide array of customization tools makes this HD video converter for Mac a solid choice for 2019 AVI to MP4 converter for Mac, in particular if you need to do more edition. Specifically, you can split AVI or merge multiple AVI files into one video in MP4, crop it to smaller size and even add watermark to make the vide unique, while converting AVI to MP4. Besides, it even optimizes AVI conversions for specific devices (like AVI to iPhone, AVI to iPad, Sony PSP, Blackberry and many more). * This AVI converter for Mac produces high-quality MP4 video. * Some buttons appear to have a confusing icon. * It takes a massive amount of system resources. Aiseesoft Video Converter tops our list in our review of 2019 best AVI video converter for Mac. The output quality leaves little to be desired as it converts AVI and other videos to HD format, including WMV HD, HD TS, HD MTS, and so on. If you are always concerned about on-the-move playback, Aiseesoft is a must-have regarding to a versatile video converter for Mac. The output video files are highly compatible with even the most popular iPhone 6S/SE, iPad Air, Galaxy S7. * Output high-quality video files. * Lacks some essential features like DVD burning and subtitle adding. 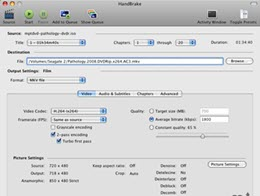 Needless to say, the very basic video converting feature, the easiness and the open source draw your attention to Handbrake from other Mac video to MP4 converters, even though it only outputs videos in MP4 and MKV. But if you only need to convert AVI to MP4 (not MP4 to AVI) for your Mac, why not taking a shot. Plus, the extra DVD ripping feature bundled in Handbrake spares yourself the trouble in finding an additional tool to rip DVD as well. * Adjust the video quality to suit required file size. * It sometimes crashes and won't work well on El Capitan. Tip 1: How to Play AVI on Mac OS X? AVI is famous for Windows compatible format and is isolated from Mac platform. Installing a QuickTime plugin called Perian can somehow solve the AVI won't play on Mac problem. But considering its inactive development, resorting to some video players for Mac like VLC or 5KPlayer can be a good option. Or else, the above mentioned AVI to MP4 converter Mac users can rely on is must-have. AVI and MP4 are both the most popular and widely compatible video formats. AVI occupies much hard drive space due to the minimal compression features to reserve good quality, while MP4 is smaller in size and compresses with video codec Xvid, MPEG4, H.264 MP3, AAC, so if you are looking to stream or store videos on your mobiles, MP4 is your better bet. See more AVI versus MP4 details.